Those of us fortunate enough to love and be loved by an animal know the exquisite joy and deep fulfillment that comes from animals living in our hearts. We know there is no turning back from loving animals wholeheartedly once we experience this bond. Animals and their love stay in our souls, once we've let them in. And we are better for it, more complete, more whole, more compassionate, and often transformed. In loving so much, we open ourselves to profound intimacy, the searing pain of loss, and the growth that comes from both. Loving this much, we may also know the tremendous passion and commitment as well as the frustration, overwhelm and compassion fatigue inherent in animal rescue and activism from ongoing exposure to negligence and cruelty to animals. 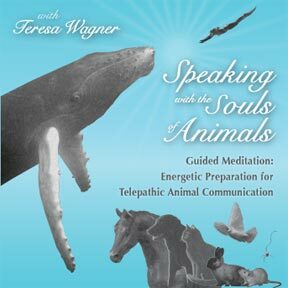 The content on this site, including descriptions of available grief counseling, animal communication consultations, books, CDs and classes on animal communication and healing, grief and loss, and resources for sacred activism are designed to help us deepen our spiritual intimacy with animals, resolve problems with and honor animals, assuage the suffering of animals, heal from the pain of losing animal companions and from being witness to the suffering and loss of animals in the environment, and to celebrate with like minded people the joy of our miraculous, spiritual connection with all animals. I wish each of you and the animals you love and serve many blessings, much love and grace. 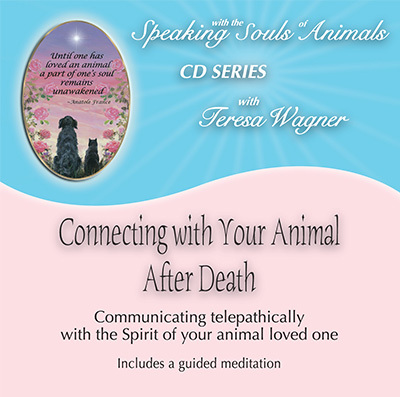 May this web site serve you in your life journey with animals. Click arrow for a message from Teresa.